James C. Dale, age 91. Beloved husband of Sandra Woodworth and the late Rae Ellen (nee Lohrke) dear father of Rae Ellen Smedley (Brad) and James H. Dale (Debra C.), step-father of Michelle Kelly (Scott), grandfather of Catherine, Matthew and Steven Smedley, brother of Neil (Sandra Ribble), Beverly Prenatt (Robert), Charles (Laura) and Dennis (Roberta) and dear uncle to many nieces and nephews. Jim was born in Old Brooklyn and never lived farther away than Catawba Island. He was a US Army veteran, serving at the end of WWII. Jim was a 63 year member of the Masonic Order and member of Oliver H. Perry Lodge #341 and a 32nd degree Mason of the Valley of Cleveland. Jim was Past Grand Patron of the Grand Chapter of Ohio, Order of the Eastern Star and Past Patron of Ellbrook Chapter #408 and Port Clinton Chapter #267. 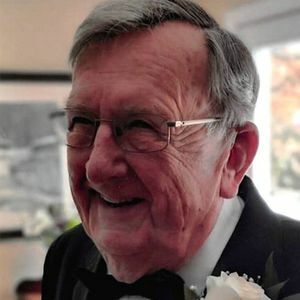 He passed away on Tuesday, March 26, 2019. Friends may call at the Busch Funeral Home, 7501 Ridge Road, Parma from 11:00 AM – 12:30 PM on Saturday, April 13, 2019 with an Eastern Star Service at 12:30 PM. A Celebration of Life Service will follow at 1:00 PM. An additional service in Port Clinton will be held at a later date. Memorial contributions may be made to Children's Dyslexia Center Cleveland, 3615 Euclid Ave, Cleveland OH 44115. Cremation by Busch Crematory (440) 842-7800 www.buschcares.com.